Enjoy the convenience of an online health profile with the comfort and style of our Signature Filigree design! 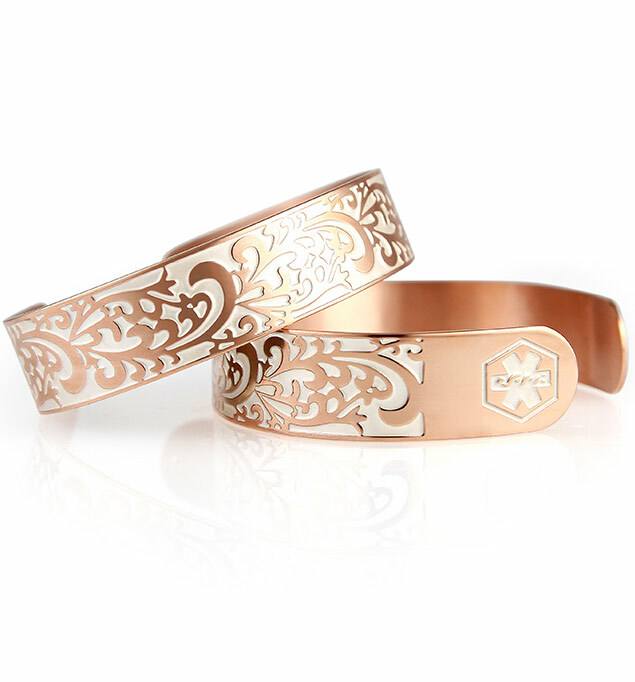 The Rose Gold Tone Filigree Medical Alert Cuff is our most beloved cuff design. Intricate yet simple, this half-inch-wide stainless steel medical ID cuff is the last word in elegance, embellished with an intricately scrolled design. Each end of this water-resistant medical alert cuff bears the internationally recognized medical caduceus symbol in white, which alerts first responders to your medical information. The Rose Gold Tone Filigree Tech Med ID Cuff varies from our standard Rose Gold Tone Filigree Cuff by including a secure MyID online health profile account, which first responders can access via QR code, website, or 24-hour call center. These access points come laser engraved on the back, and your MyID service is included with your purchase. Tech med IDs are particularly convenient for people with complex medical histories, changing diagnoses or contact numbers, frequently changing medications, or long lists of medications and/or allergies. This tech med ID is a terrific option, whether you wear your medical alert for lymphedema, hyperthyroidism, diabetes, a stinging insect allergy, steroid use, or any other medical condition or treatment consideration. This cuff fits most adults with wrists measuring 6 to 7.5 inches.